306 Sd.Kfz. 166 sortirent des usines Deutsche Eisenwerke entre avril 1943 et mars 1945 ; la version tardive -Abschlußserie- fut produite à partir de juin 1944 à 166 unités basées sur des châssis de Pz. IV Ausf. H et J. Un moteur Maybach HL120TRM de 300 cv propulsait ce véhicule de 28,2 tonnes à 40 km/h, 470 l d'essence permettaient de rouler 210 km. Les 5 tankistes étaient au mieux protégés par 100 mm d'acier. Le puissant obusier " Sturmhaubitze 43 L/12 " de 150 mm était doté de 38 obus. Deux mitrailleuses Rheinmetall MG 34 de 7,92 mm approvisionnées à 600 coups complétaient l'armement du Brummbär. Plus aboutie, cette version finale du Grizzly de la Wehrmacht fut la meilleure. Le Stupa fut engagé au combat en France, en Italie et sur le front de l'Est pour le soutien de l'infanterie allemande. Between April 1943 and March 1945, 306 Sd.Kfz. 166 rolled out the facilities of Deutsche Eisenwerke. 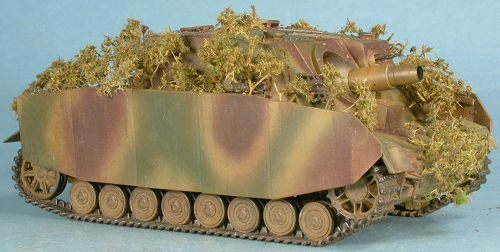 The late production version -Abschlußserie- has been produced as of June 1944 and eventually 166 units utilising the Pz. IV H & J chassis were delivered. One 300 hp HL120TRM Maybach motor powered this 28.2 tonnes vehicle. The top speed was 40 km/h and the top range reached 210 km. The crew of 5 was at best shielded by 100 mm thick steel plates. 38 shells were carried for the powerful "Sturmhaubitze 43 L/12" howitzer. Two 7.92 mm Rheinmetall MG 34 machine guns endowed with 600 cartridges supplemented the weaponry of the Brummbär. This late production Grizzly was much better engineered and thus the best. The Stupa brought a useful close support for the Wehrmacht in France, Italy and on the Eastern Front until the last days of WWII.